Jordan Wright was a 16 year-old boy diagnosed with Muscular Duchenne Dystrophy. He loved cars, video games, and had tried mac and cheese – his favourite food – from BC to California. Canuck Place Children’s Hospice allowed Jordan to feel like any other teenager – Getting into mischief, spending a night away from his parents, and hanging out with friends. While Canuck Place provided a place for Jordan to be himself away from home, the staff also took care of his parents, providing a warm welcome with every respite stay. 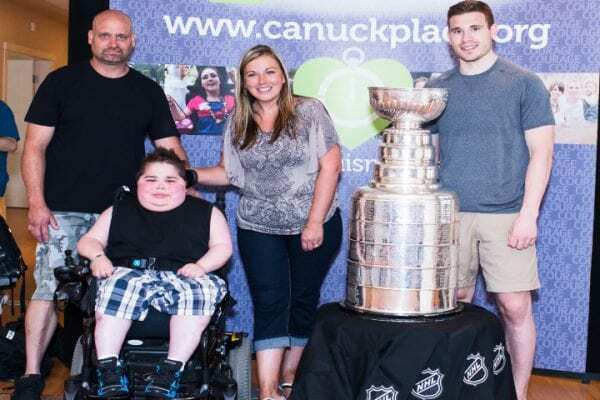 In August 2015, Jordan and his family were invited to a special event at Dave Lede House in Abbotsford. Kyle Cumiskey was bringing the Stanley Cup, accompanied by the Abbotsford Fire Department. Jordan was a recent hockey convert; sold on the game following an afternoon spent playing NHL 15 with Eddie Lack. Jordan passed away unexpectedly that night. But the day spent at Canuck Place provided special memories for the family, and a lasting memento. Greg and Tiina have remained a part of the Canuck Place family. The night Jordan died, a Canuck Place counsellor was there within an hour to support them through their grief. They continue to attend bereavement groups, forming friendships with other parents. You can support Canuck Place families by donating today.